Marek Kwiek invited to hold a research symposium at DZHW Berlin (German Centre for Higher Education Research and Science Studies) on "Research Productivity Patterns"
Marek Kwiek was invited to a hold research symposium at DZHW Berlin on December 11, 2018: German Centre for Higher Education Research and Science Studies. The title of the lecture will be: „Research Productivity Patterns across European Systems: the Power of Highly Productive Scientists and Inequalities in Science„. The German Centre for Higher Education Research and Science Studies (DZHW) organises research symposia to provide a forum for presenting and discussing current research work and findings in higher education and science research. The symposia in Hannover and Berlin give participants the opportunity to gain information and exchange views on current issues. They are addressed to DZHW employees, external speakers, members of Leibniz Universität Hannover and Humboldt Universität zu Berlin as well as all interested members of the public. The German Centre for Higher Education Research and Science Studies (DZHW) carries out application-oriented empirical research in the field of higher education and the science system. It sees itself as a partner and service-provider for the world of science and scientific policy. Its research is theory-based and practice-related. The DZHW contributes its research findings to academic discourse; it is part of the scientific community. The data and analyses produced by the DZHW also support policy-makers, higher education institutions and educational management in shaping higher education in Germany and Europe. It provides important information for comprehensive, sustainable, evidence-based higher educational and educational policy. The seminar is part of a global promotion tour of Kwiek’s recent book, “Changing European Academics. 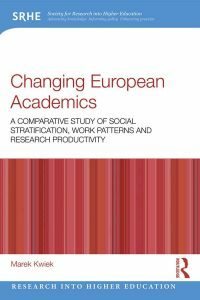 A Comparative Study of Social Stratification, Work Patterns and Research Productivity” (London and New York: Routledge 2019, 274 pp. ).